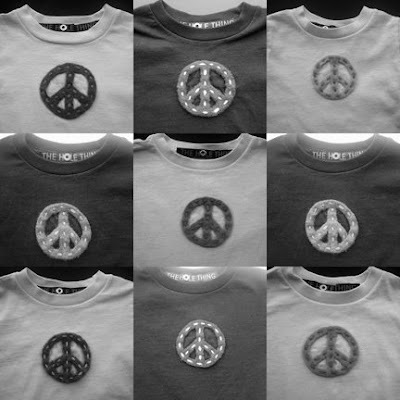 Today THE HOLE THING made a stack of kid's felted peace sign t-shirts for a new store in Boston called OAK. The store, whose name is short for 'one of a kind' is located at 31 Gloucester Street at the corner of Newbury Street. It is a hip & cozy boutique full of wonderful handmade creations. They have everything from clothes & accessories to lots of very cool gifts that you won't be able to resist. Peace baby ! I love your work! I first saw it at the Larz Anderson Festival in the Park last summer. I was at OAK today, but I didn't see your shirts. Have they gotten there yet?